to enable us to be Overcomers! Mighty men and women of God. that we need to wear every day. put on those pieces of armor afresh and anew. the sword of the spirit which is the Bible. For these are the pieces of our armor. I have put on the Full Armor of God. I am dressed and ready for Victory. I walk in the authority of Jesus Christ. I have the power to rule and reign with Christ this day. I will prevail over them in the name of Jesus. I give you exuberant praise this day. You are Lord of all, and you are worthy of my praise. You are the Most High God. You are All Powerful. Thank you for the strength that you graciously give to me. Thank you that it is your will that I walk in your POWER this day. Thank you that your Word declares that it is your will that I walk in power, love, and a sound mind this day. Thank you that you show me how to speak out your scriptures, believe in your truth, and display your will in my life. Lord, I will trust in you. I will be bold in your name. I stand up and declare that I am strong in the Lord. I am a triumphant follower of Jesus Christ. I am more than able to show forth that the power of God is working for me this day. Thank you, Lord, that you are giving me strength to choose your voice over the voice of the enemy or the voice of my flesh. I want to obey you. Thank you that you defeat confusion in my mind, discouragement in my heart, and weakness in my body. Thank you that you are bringing refreshment and rejuvenation to my day. I have faith that you are showering me with your love and mercy. You are filling me with what I need. You are teaching me how to love you and love others more fully. You are guiding each of my steps. I have faith that you are providing everything I need. I will receive bountifully from you, and I will give you praise. I declare that your inspiration, revelation, motivation, and determination are bringing transformation in my life. Thank you for changing me to become more like you. Thank you that you have given me your secret armor. Thank you that you are teaching me how to defeat the enemy. Thank you that I was born to be the head and not the tail. Thank you that you are bringing me victory! come to hinder me are powerless over me this day. confounded, and conquered by the power of Jesus Christ. Conquered our enemies and put them under his feet. For who is God except our Lord? Who but he is as a rock? He fills me with strength and protects me wherever I go. He gives me the sure-footedness of a mountain goat upon the crags. He leads me safely along the top of the cliffs. He prepares me for battle and gives me strength to draw an iron bow! You have given me your salvation as my shield. Your right hand, O Lord, supports me; your gentleness has made me great. You have made wide steps beneath my feet so that I need never slip. I chased my enemies; I caught up with them and did not turn back until all were conquered. We also have spiritual warfare prayers available and teaching on spiritual battle and renewing your mind. We have lots about the Full Armor of God. Consider starting with the Shield of Faith! 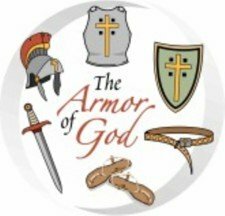 We have LOTS of other Full Armor of God POWER Prayer pages listed on our Bible devotions page.